Since the Gold Rush the 3 Card Monte and the 3 Shell Game have been the most popular gambling scam used in the USA. The 3 Disk Monte is very popular throughout Europe and the UK and is starting to be popular in the USA. Our intentions in selling the 3 Disk Monte sets is to make them available in the USA. (to be used for educating and entertainment only). The Monte scam is a game where the operator has 3 disks. One of the 3 disks has a distinct mark below it (usually a white dot). We offer a wider selection other than just the white dot. The operator will initially show you the bottom of the disks, then the disk are thrown to the surface and the disks are shuffle around quickly. In order to play, you need to bet some money (not with the magician). Then in order to win you need to pick the disk that has the mark below it (after the disks have been shuffled and without being able to see the disk bottoms). These disk sets bring many new features to perform this classic. The disks Matching Scratch Resistant on both sides of the disk and the marked disk has a embedded small disk. These two main features bring a better looking and working disk to the table. What does the textured scratch resistant surface on both sides of the disk bring to the table? (a) Takes way the sliding of the disk after they are thrown to the surface. (b) All sides of the disks have a matching textured surface, even the marked embedded disk has a textured surface to keep the disk scratch free and free from sliding. What does the embedded marked disk bring to the table? (a) Never need stickers or have to re-paint the dot like other disk. (b) Textured surface to stop the disk from sliding on the surface. ( c) Larger selection for the marked disk. ( d) Mark disk inserts can be ordered in plastic or different metals. (e) Metal mark disk inserts will give a slight weight difference to always know the winning disk location when mixing the disks around in play. Cover the Spot is a game that involves covering a spot with five smaller disks. This game is deceptively difficult, although this game is not like the shell game or the Monte game it requires a very high level of accuracy to win. The rules of the game are quite simple: place one disk at a time on the spot playing surface; the disk must be dropped from a certain height; the disk cannot be moved once it is dropped; and all the disks must completely cover the spot. Our version of this game was designed to carry with ease, by making the large spot disk to fold in half with a transparent tape hinge that opens to a perfect large circle. It is a two ply plastic disk, red on one side and white on the opposite side. This brings two different color contrast options. Black on red or black on white, whatever you prefer. Cover the Spot comes with one large disk and five smaller disk. This is a high quality made set. The routine can bring amazing entertainment for a small price. Comes with Cover the Spot instructions. * This is one of the most compact and light weight entertaining packages you can carry with you. * Does not take much space to play. * Can you imagine having some fun with the game set at your local pub for some beers! * The thin plastic disks do not make loud sounds when dropped to the surface. * Very visual to attract the mark. * The mark gets hands on fun! 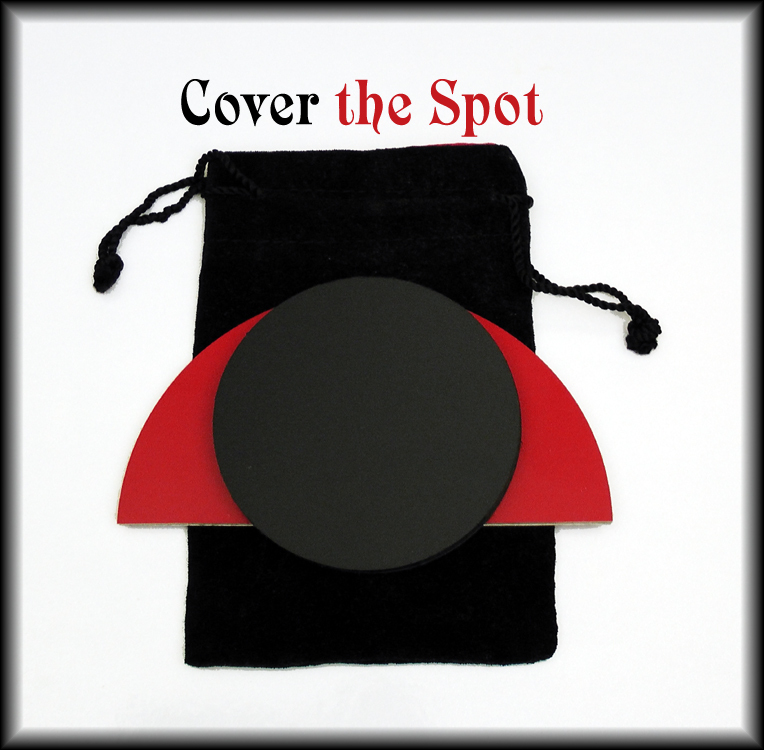 * Cover the Spot is a legal game to play, but the odds to win are very high.